A group of alumni returned to Nelson and Colne College to take part in a fun and engaging speed meeting event. 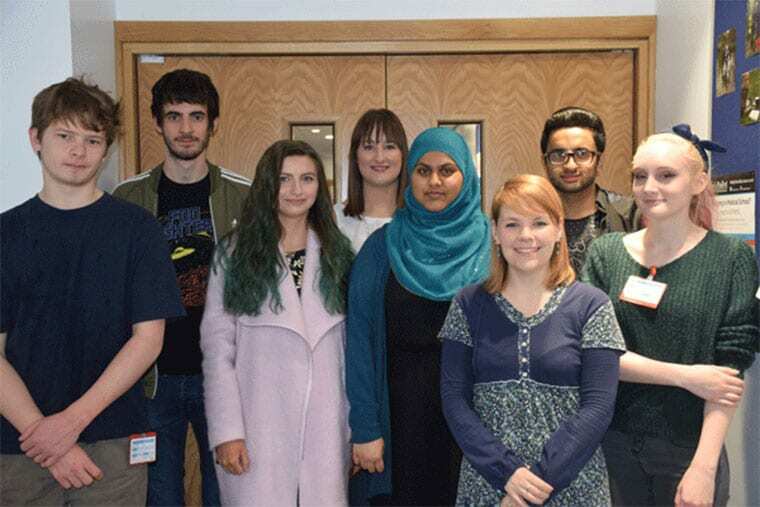 Eleven former students were invited back to the NCC Science, Maths and Computing department to talk to and inspire students about their degrees and University life, and catch up with their former tutors. Each current student was given a set amount time with one alumnus before a bell was rung for them to move to the next person. At the end of the session, they were then given opportunities for more in-depth conversations with anybody that had sparked a particular interest. Curriculum leader for A Level Science Brenda Rowan said: “The event was brilliant, and definitely is something we will do again. “There was a real buzz in the room, and our former students were happy to get involved and give something back to the College. Former Park High School student Chantelle Waddington (17), who is studying Maths, Biology and Chemistry at Nelson and Colne College and who hopes to study Medicine at University, said: “It was really exciting being able to talk about the different paths people have taken and it made me see all the different options I have. “The fact that we were speaking to people who used to attend NCC made us relate to them – they have been in our shoes, and they could talk to us about University life. Everybody really enjoyed themselves and each person managed to find one person they could ask questions to after the event. Former students in attendance for the event were: Lauren Tansey (Mathematics, University of Leeds), Juwairyah Daar (Pharmacy, University of Manchester), Kiah Maiden (Genetics, University of Leeds), Amelia Cockell (Biomedical Science, University of Lincoln), Aaminah Rafique (Optometry, University of Bradford), Robin Stringer (Zoology, Queen’s University Belfast), Lewis Turner (Artificial Intelligence and Computer Science, University of Birmingham), Kiran Sharif (Chemical Engineering, University of Manchester), Sabrina Farooq (Orphoptics, Glasgow Caledonian University), and Sarah Kendall (Microbiology, University of Leeds). Alumnus Lauren Tansey said: “The event was really good, and it was great to see all my former tutors. Despite the fact students leave College, they forever remain a part of its community – and staff and studentsalike always love to hear how alumni are progressing. Are you a Nelson and Colne College alumnus? Let the College know how you are progressing by visiting the “Nelson and Colne College” Facebook page! For more information about Science, Maths and Computing at Nelson and Colne College contact 01282 440272.